Includes all three books in S.T. Bende’s internationally bestselling ELSKER SAGA, plus the bonus novella, TUR. Winning the heart of an immortal assassin was a dream come true for Kristia Tostenson. But her decision to become immortal could end in heartbreak--not only for Kristia, but also for the god who loves her. While Ull would do anything to protect his bride, even the God of Winter is powerless against the Norse apocalypse. Ragnarok is coming . . . and the gods aren't even close to ready. As things heat up between Kristia and Ull, a frost settles over Asgard. Kristia's barely begun to understand what she's capable of, and controlling her powers seems completely out of her grasp. With her new family fighting for their lives, and Ull fighting for their future, Kristia has to make a devastating choice: preserve the life she loves, or protect the god she can't live without? Inga Andersson has it all—great friends, a job as Odin’s personal fight choreographer, and a happy ever after with her realm’s hottest assassin. But when evil invades Asgard, her world comes crashing down. With Ragnarok on the horizon, Inga has to decide how she’ll spend her final moments of freedom. Because once the battle begins, Inga’s perfekt life will be nothing more than a memory. A Must Read! All books are amazing. This is an amazing box set. I’ve really enjoyed reading all the books. Here are my reviews for each book. Tur – Prequel Novella - What a fun novella to read. I really enjoyed the exciting adventure of Gunner and Inga as they help defend Asgard. Gunner is definitely more fun and he is loyal, hot, and very supportive of his wife Inga. Inga is an amazing character. I love her can do attitude and her match making skills. It was really cool to see a glimpse of Ull’s heart before we see more of it in the Elsker Saga. Overall “Tur” by S.T. Bende is a fun, exciting prequel of the Elsker Saga. 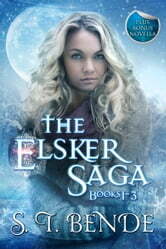 Elsker: Book One - This is one of the sweetest love stories of Norse mythology that I have read. I love the romance between the mortal Kristia and Ull the God of Winter. Kristia is an adorable girl from a small town in Oregon with a desire for an adventure so she signs up for a study aboard in Wales. Once there she meets Ull Myhr. Ull is a handsome God from Asgard. Even though he is a God and one of the finest warriors of Asgard, Ull is very lonely; which was very heartbreaking to read. Once he meets Kristia he will do everything he can to protect her – even if it’s from him and his destiny. This story shows a great development between Kristia and Ull’s relationship and her acceptance of who Ull is and what his destiny entails. I love the ever sassy Norn, Elsker, especially how she handles Thor. She is one of my favorite characters. “Elsker”, the first book of The Elsker Saga by S.T. Bende is an excellent story; can’t wait to find out what is in store for these two and their family and friends. Endre: Book Two – Wow, the second book of the Elsker Saga, “Endre” by S.T. Bende is amazing. I love reading how much Kristia is developing her visions and how much stronger she is becoming. She is starting to adapt to Ull’s world and is amazingly strong and brave while doing so. Her visions with the Elfie guy are getting more dangerous and terrifying. Every time she has one I’m biting my nails on what is going to happen. I love the growth of Ull’s and Kristia’s relationship and how Ull’s starting to be a little less overprotective. It’s sweet on how much he does want to protect Kristia but at the same time beginning to trust in her to hold her own. Gunnar of course is “funner” as usual. I love how much closer Kristia has become with Inga and Olaug. These lovely supporting ladies are such a joy to read. The wedding is magical and romantic. Endre has wonderful relationships and more character building on not just the main characters, Ull and Kristia, but of their supporting characters too. Definitely a wonderful continuation of the Elsker Saga. Tro: Book Three – Talk about battle action and nail biting. “Tro”, the final book of the Elsker Saga by S. T. Bende is full of action and romance. The first part of the book is so romantic with the honeymoon of Ull and Kristia. However not even a honeymoon can take away what is in the rest of the book – the battle of Ragnarok. With Kristia learning her new powers as the Goddess of Winter and immortal seer she still has a lot to learn before she is ready. The action of Ragnarok keeps you on your toes and the excitement is so captivating you will not want to put the book down. The ending for me was one of the most heartwarming endings I have read in a long time. When I finished this book I was smiling for days. Ull and Kristia has such a heartwarming story. I highly recommend this book and the entire Elsker Saga! All I'm going to say is that I wish this book could have another spin off series featuring their adventures with their newborn. Light-hearted, engrossing storyline, and likeable characters. Would be interested in reading about this family further. Loved this set of books, could not put it down but wished S.T would write a fifth book dealing with the baby's gifts, That would be the icing on the cake.